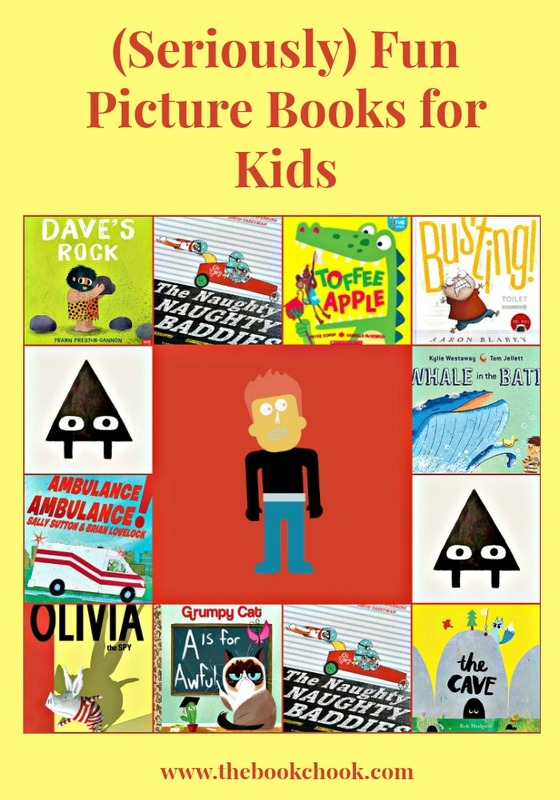 Sometimes what we want to share with kids is a picture book that will truly help them celebrate the FUN of reading! Here are some stand-outs I’ve discovered recently. Dave’s Rock by Frann Preston-Gannon, published by Nosy Crow (Allen and Unwin) (2017.) RRP: $Au 24.99 HB. Dave love rock. Jon love rock, too... Who have best rock of all? The children I read to think it’s hilarious when I use caveman-speak. They very much enjoyed Bear Make Den, and now they love Dave’s Rock too. Kids everywhere will understand and giggle over the competition that exists between Dave and Jon - “Dave’s rock bigger.” but “Jon’s rock faster.” After the two cavemen sort out their problems, Preston-Gannon sets up the older reader to expect Dave and Jon to collaborate and invent the wheel…the surprise ending will cause lots of laughter and satisfied smiles. Preston-Gannon as illustrator has chosen lovely ochres and greens for the backgrounds which are gorgeously printed and textured. I loved how similar the hairy cavemen’s head shapes were to the rocks they competed with, and must admit I enjoyed their Flinstone-style clothes. Dave’s Rock makes such a fun read-aloud to share with kids 3-6! Toffee Apple and Other Fun Songs is a children’s picture book by Peter Combe and Danielle McDonald, published by Scholastic (2017.) RRP: $16.99 PB. I reviewed Juicy Juicy Green Grass and other songs back in 2014. Toffee apple, nice and licky, One for Judy, one for Nicky. Crunchy munchy, very sticky! Don’t forget to clean your teeth! Sing along with three of Peter Combe’s fun songs: Toffee Apple, Newspaper Mama and Err Yuck! I have always loved Peter Combe’s songs for kids. I’m thrilled that Scholastic are releasing some of the songs in children’s picture books with accompanying CD. This means children can read along while listening to the songs - wonderful for their reading development! The bonus is they get to learn the songs as well, and I think this really enhances their listening and musical ability. Toffee apple, nice and licky, One for Judy, one for Nicky. Crunchy munchy, very sticky! Don’t forget to clean your teeth! McDonald’s illustrations are brightly coloured, fun and popping with enthusiasm, luring any young reader to take a peek. I think Toffee Apple makes an excellent resource for classrooms, school libraries and homes. Triangle is a children’s picture book by Mac Barnett and Jon Klassen, published by Walker Books (2017.) RRP: $Au24.99. I have previously reviewed Sam and Dave Dig a Hole by Barnett and Klassen, and Klassen’s This is Not My Hat and We Found a Hat. Children are quite fond of sneaky tricks - but not perhaps ones played on themselves! They will enjoy reading about Triangle’s naughty plan to frighten Square, and revel in the table turning that takes place. Triangle makes a great read-aloud - it has humour and tension, as well as engaging illustrations for children to look at. I just love the art work in Triangle. The background landscape of Triangle’s journey starts out with small neat triangular hills, much like kids draw themselves. But as the background shapes change in the landscape, and the colours become more ominous, so the tension rises while Triangle journeys on. Triangle himself is only a small black triangle with the addition of two black legs, white eyeballs and black pupils. Those eyeballs combined with the words of the story convey a wealth of meaning! Square is similar - simple black square shape with legs and eyes. I love that children will be able to use these models to draw their own shape characters for further adventures. Book Chook Feather of Approval for this one! Grumpy Cat: A is for Awful by Christy Webster and Steph Laberis, published by Golden Books (2017.) RRP: $Au4.99. Subtitled A Grumpy Cat ABC Book, this little Golden Book is a follow on to the Grumpy Cat golden book I told you about in Happy Anniversary, Little Golden Books! While it IS an ABC book, it’s also more than that, and is held together by Grumpy Cat’s attitude of grumpiness, sustained throughout. It’s as if some kind person is introducing an alphabet letter and it’s corresponding image, and then we get Grumpy’s inevitable negative reaction, also linked to the same alphabet letter. Example: "F is for FLY." "Forget that. F is for frown." If you don’t know the Grumpy Cat books, do look out for them. Not only would that make a great choice for kids everywhere, I'll bet you know someone grumpy who might really appreciate them! Busting is a children’s picture book by Aaron Blabey, published by Scholastic Australia (2017.) RRP: $Au16.99 HB. Lou’s not having a great day–he’s busting for the loo to do his do, but the loo has too long a queue! Have you noticed how children find anything to do with toilets laugh-out-loud hilarious? Blabey has cleverly capitalised on this in his latest book for kids. With rhyme, a cast of quirky characters, the tension of increasing desperation - “I have to do my do, it’s due! In fact, it’s overdue! OOOH!” - a range of silly toilet alternatives and a final non-rhyming twist, Blabey provides lots of scope for giggles and guffaws. Making sure our young readers have access to books that tickle their funny bones is a no-brainer. We want kids to associate reading with pleasure, and books that make them laugh is one way to do this. I have also reviewed Blabey’s Pig the Winner, Thelma the Unicorn, I Need a Hug, and Pig the Elf. Whale in the Bath by Kylie Westaway and Tom Jellett, was published by Allen and Unwin (2017.) RRP: $Au 14.99. It's bathtime, but there's a whale in the tub and Bruno can't get in! No one in his family believes him and Bruno keeps being sent back to the bathroom until, at last, Bruno and the whale work out a very splashy solution. A wonderful story that humorously explores bathtime and a playful celebration of a child's imagination. The only thing worse than having a whale in the bath would be having nobody believe you that it’s there. Not only that, but this whale just won’t leave. Poor Bruno! No matter what he tries, the huge creature stays put. Kids will recognise and enjoy each family member’s different response to Bruno’s whale tale. I think it will make an interesting discussion to determine whether Bruno was inventing the whole thing. Personally, I don’t think so! Olivia the Spy by Ian Falconer, was published by Simon and Schuster (2017.) RRP: $Au24.99 HB. Olivia is such a great character! Her antics can be enjoyed on one level by quite young kids, for many of whom she will become a heroine, and appreciated on a different level by older kids, who will no doubt recognise her in their younger siblings. Olivia doesn’t need to be told how to do something because she knows it already, and her creative attempts at spying sadly make her leap to the wrong conclusions. However, even when she believes she’s going to prison, Olivia doesn’t whine, but packs a few “pitiful possessions” and bravely enters the car. Drama queen yes, but one worthy of our admiration too. Falconer manages to add even more humour to the book via his striking, brightly coloured illustrations. There are larger images, and also cameos, all of which sing with attitude and fun! Kids will love the way Falconer shows Olivia investigating by blending into the background - we see Olivia as a lamp stand, a zebra rug and hiding in a mouse hole. Theres also a wonderful scene where Olivia accidentally (she tells her mother she needs no help to find the bathroom at the ballet) wanders on and off the stage behind the dancers. Olivia the Spy will have young readers in gales of laughter, and I predict read-alouders will be reading through their own chuckles! Loved it! Ambulance, Ambulance by Sally Sutton and Brian Lovelock, published by Walker Books (2017.) $Au24.99 HB. I have previously reviewed Sutton and Lovelock’s Roadworks. Bleep, bleep. Emergency! News just through: Crash, crash, there’s been a crash. Let’s go, crew! Nee nar nee nar. An exciting new collaboration from Sally Sutton and Brian Lovelock, bestselling and award-winning creators of Roadworks, Demolition and Construction. Here’s a children’s picture book that is bursting with colour, action and noise. It’s perfect for under 5s, both as a read-aloud, and as a choice for kids learning to read. There are lots of details in the pictures to aid comprehension, and the brief rhyming lines will also help children to memorise the text. I am looking forward to reading it to my pre-school group, in confident anticipation of our Nee Nar Nee Nar lifting the library roof! What a wonderful choral piece this text will make. Sutton has chosen so many onomatopoeic words, and simple rhyming text that will have kids itching to join in. Books that encourage participation are a read-louder’s dream, and librarians know that books about vehicles are a magnet for preschool readers, especially boys. Ambulance, Ambulance is also an exploration of paramedics and ambulance crews for our younger readers. It’s a great choice for a resource list centred around jobs people do, or one on community. The Cave by Rob Hodgson, published by Frances Lincoln Children's (Murdoch Books in Australia.) (2017.) RRP: $Au24.99 HB. There is a cave. A cave that is home to a creature. A creature that never leaves its cave. Because of a wolf. The wolf tries everything to get the creature to leave the cave, to no avail. But what will happen when he's finally successful? This is a laugh-out- loud story with a BIG surprise! For ages 3+. The Cave is a children’s picture book that tells us of a wolf’s attempts to coax a creature out from a cave. Ostensibly to play, but kids will soon be inferring a lot more about the wolf’s agenda. The wolf tries various strategies, determined to persuade the little creature, and kids will very much enjoy the creativity of these efforts. People of my vintage will remember a certain coyote who never seemed to achieve his ends either! There’s a great twist at the end, concluding a very satisfying tale. As you will see from the cover, Hodgson’s illustrations really stand out. They are clear enough to work well when shown in a read-aloud i.e. from a distance, but they will also be fruitful on closer inspection. There are details for kids to look for on each page, details like the wolf’s plate, knife and fork that will certainly contribute to the narrative. This is just the sort of what I call a “graphic design” style that I love, and Hodgson is now on my list of favourite children’s illustrators! The Naughty Naughty Baddies by Mark Sperring and David Tazzyman, published by Bloomsbury (2017.) RRP: $Au14.99 PB. WHAT will the Queen do when she sees her spotless Little Doggy Woof-Woof? WILL the Naughty, Naughty Baddies get away with it? This children’s picture book is lots of fun, with craziness crackling off each page. Children will adore learning about what the naughty baddies get up to. I predict kids will want to practise their own baddy nasty-faces, and suspect their own writing may be inspired by the naughty adventures of Baddies One, Two, Three and Four. Tazzyman’s illustrations are priceless, definitely adding to the mayhem and hilarity. Another great choice for a read-aloud!